a) Spirit Lamp :- Aluminium sheet die pressed capacity 125 ml. b) Spirit Burner :- (Spirit Lamp). As above but brass die pressed. Capacity 125 ml. c) Spirit Lamp :- Made of stainless steel die pressed. Capacity 125 ml. Glass Agencies EROSE are manufacturer of Spirit Lamp. 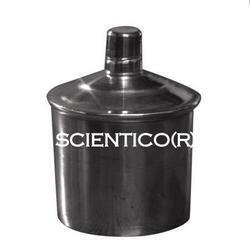 We offer spirit lamp made from SS for lab use. - This Spirit Lamp is made up of Stainless Steel and is a good laboratory accessory. Spirit Lamp Sheet die pressed, with woven wick in metal holder, screw on cap. Capacity 100ml. STYLE #. 2040, RED COLOR On Glass with metal work of Copper & BrassSilicon wick 5mm, Burning Flame Mode (0% Smoke) SIZE : H-5.5 X L-2 X W-2, INCH. (100 ml) FINISH - SILVER ANTIQUE POLISHED. With our expertise and trustworthiness, we are engaged in offering an optimum quality range of Spirit Lamp. 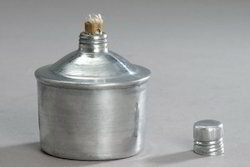 Spirit Lamp or Alcohol Lamp used for heating the dopping wax and/or the gemstone while dopping. Used with all pre-forming and faceting and polishing machines It is made of stainless Steel Spirit Lamp and the sheet is die pressed, with woven wick in metal holder with screw on capped. Also available in glass, aluminum & brass. Glass with brass wick holder and glass top cover. Capacity: - 60 and 125 ml.